"I have never found better customer service. I've been ordering my supplies online for years and I'm sticking with Lymphedema Products. Thanks so much for your committment to your customers!" Designed for patients with swelling or tissue fibrosis in the trunk or torso, the Tribute Vest features vertical channels and a front zipper closure. 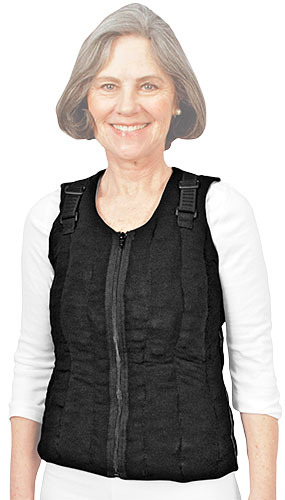 Patients report therapeutic benefits while wearing the vest over garments as a �fashion item. "It comfortably fits one�s lifestyle while worn at night, while sleeping, or during the day. It now includes adjustable shoulder straps for increased comfort. Patients may choose between a V-neck, Round-neck, Scoop-neck, or Turtle-neck.